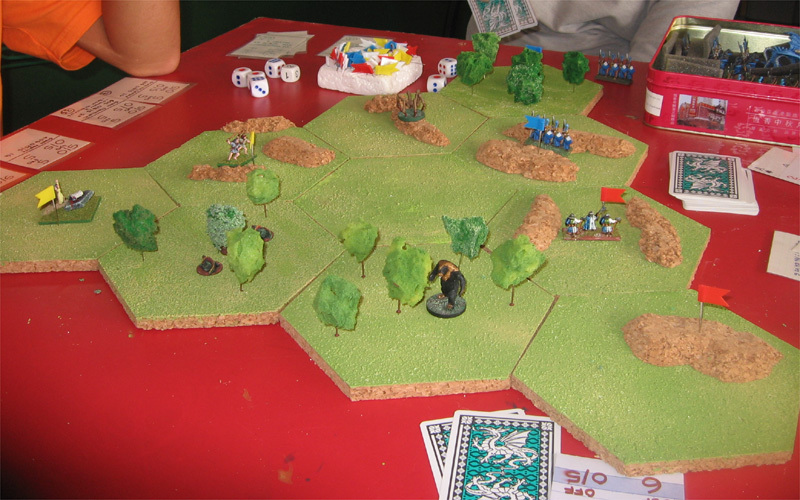 This is the first proof of concept playtest of the rules-in-development. 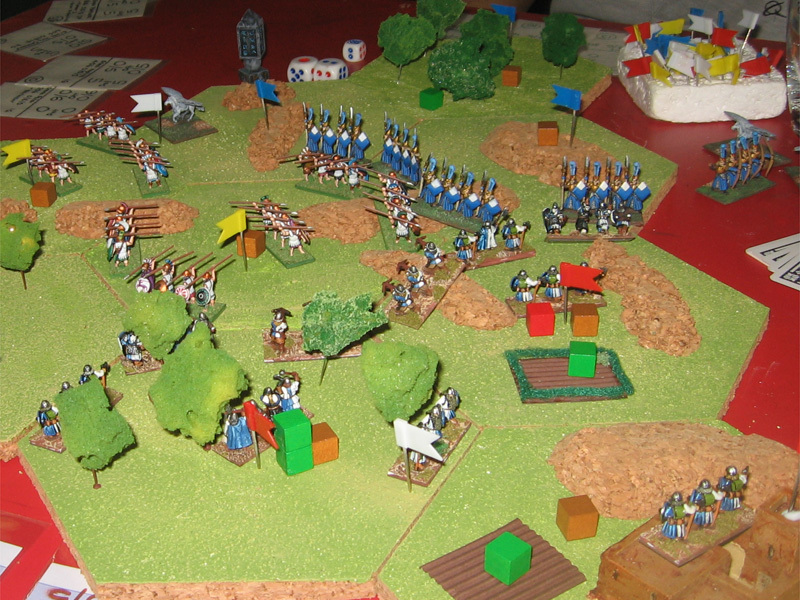 The main purpose was to check that the game flowed fast and was fun and easy to play. Also to check the two main mechanics, the Resource Card System and the Combat System worked OK. It has been a long undertaking of many years, but we Isdakduntha Dwarves have finally tunneled through the Overpeak mountains. The legends spoke true, the land is green and rich. We shall send our Rangers out to scout the land for our people. The land is rich, but full of danger. A company of Rangers found and dispatched a nest of giant scorpions but the other has not reported back, We fear the worst. The land is not empty for out taking. We have met with the peoples of legend. Across the Forests, a race of tall people who favour the open grasslands like rabbits, and like them, are weak but fill the land with their multitudes. Beyond the vast rolling hills, we have met with an even taller race who favour the woods. Their men behave not like men and their mannerism are repugnant. None-the-less, they are skilled in battle and best avoided. Still, we have found more fertile land than we ever dreamed we would find. King Isverisot has decreed that the Isdakduntha Dwarves will keep peace with our neighbours and work the land. It has been a hard 10 years. War has destroyed most of what we have built since we crossed Overpeak. But we have finally taken back what is rightfully ours and can seek peace again. Let the Men and the Elves continue to fight for their Gods, we shall build for the glory of ours. But this time, we shall not ignore our defenses. New forts shall be built and our armies kept ready for battle. Times are peaceful and appreciated all the more for the stories we hear of the long wars between the Men and the Elves. We have slowly begun to explore and settle the last of the wilderness between ourselves and the men. We have perhaps alarmed them, or perhaps they begin to learn the folly of war, but we hear rumours of peace between the Men and Elves. Our time of peace may be at an end. 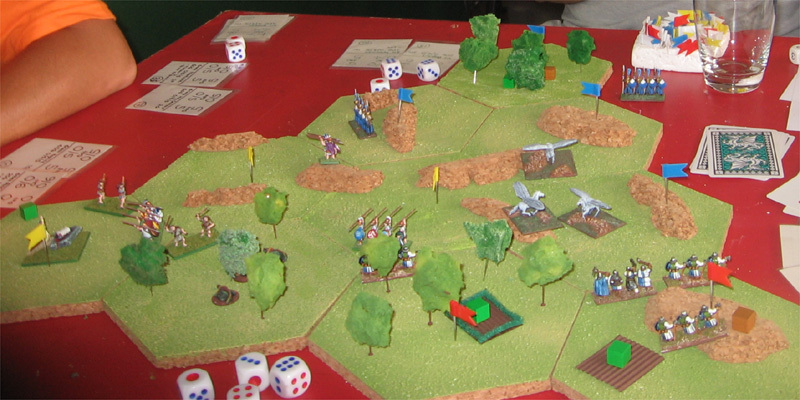 The game pits 3 races, the Elves, the Dwarves and the Humans (Greeks) in a race to conquer the land for their God. This is a Small Game and the winner is the first to conquer 5 Provinces (hexes) or build a Temple to their Gods at a cost of 80 Gold. 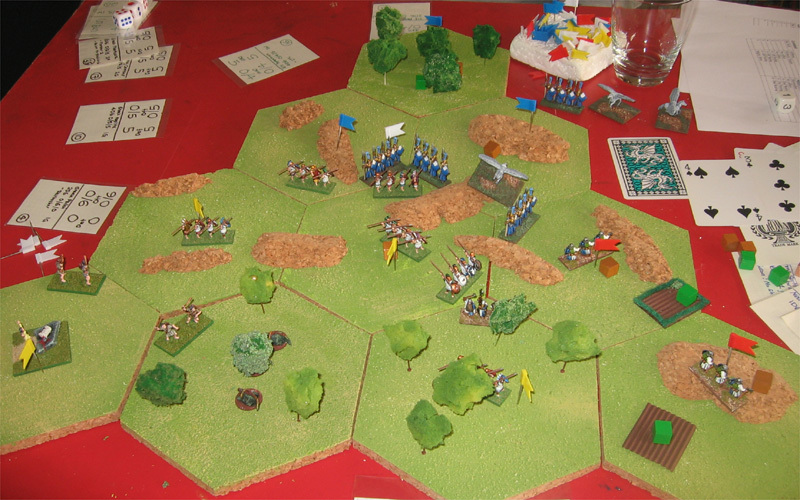 The Elves (Blue flags), Dwarves (Red) and Greeks (Yellow) have all explored adjacent hexes and have each lost a Unit to native creatures, the bear, giant spider and group of giant lizards seen in the picture. 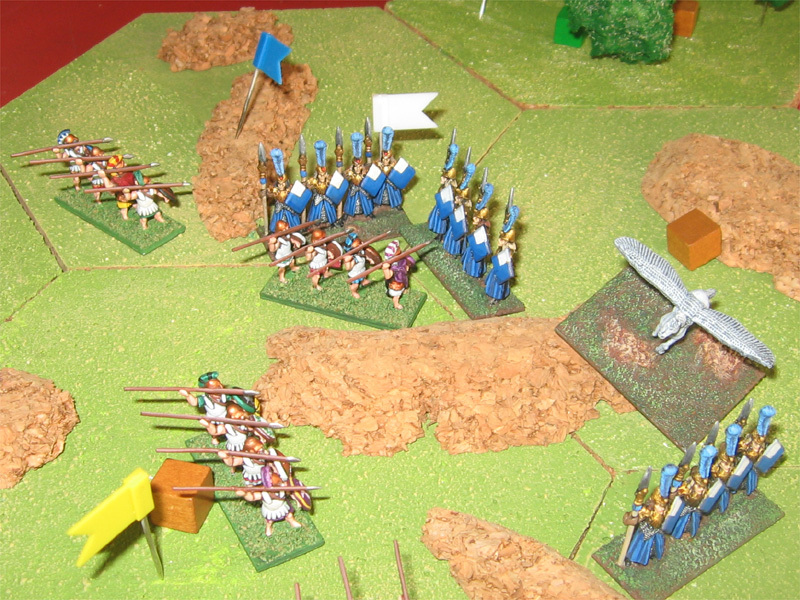 After about 20 round, everyone has expanded to 3 Provinces (hexes) with the Greeks holding the middle with Hoplites. The Elves seem fixated on Pegusi while the Dwarves are building farms (the green cube) to increase resources. ... while the Greeks simultaneously begin a push into the other Dwarven border Province. The Elves have only weak Pegusi defending the hard won Province while the Dwarves mass on the border hungry for revenge. The Dwarves take back the Lost Province from the Elves. 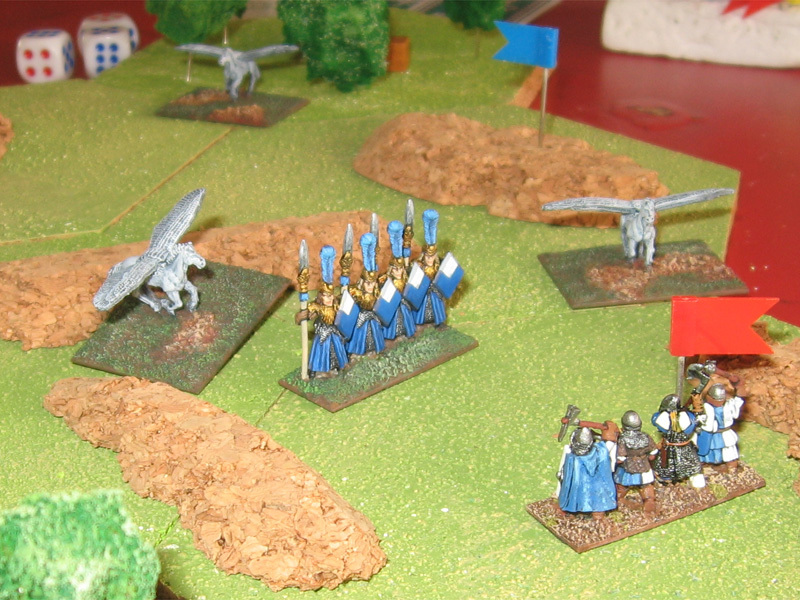 But the Greeks take advantage of the Elf/Dwarf war to launch surprise attacks on both the Elves and the Dwarves. The Dwarven Province quickly falls. The Greeks just need to conquer one Elven Province for victory. 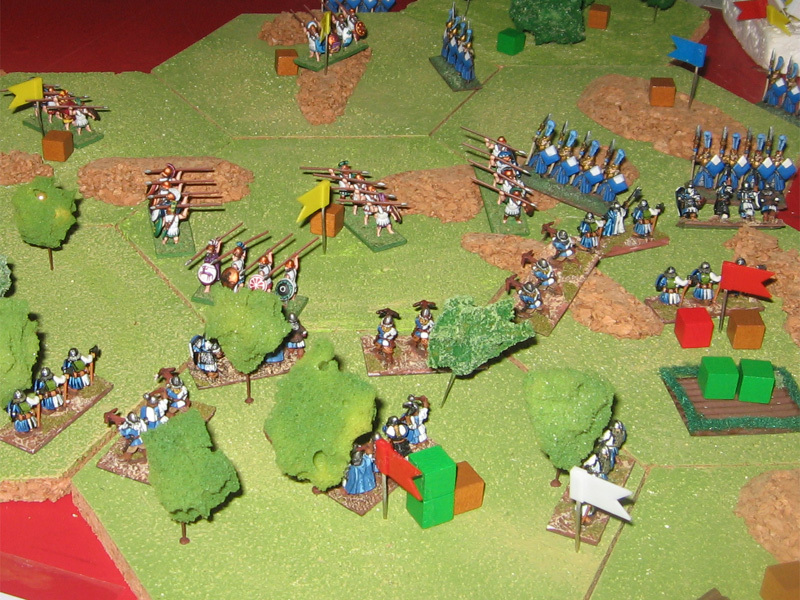 But the Elves hold out with the help of Spearmen churned out by the Barracks (the brown cube) in the neighbouring Province. 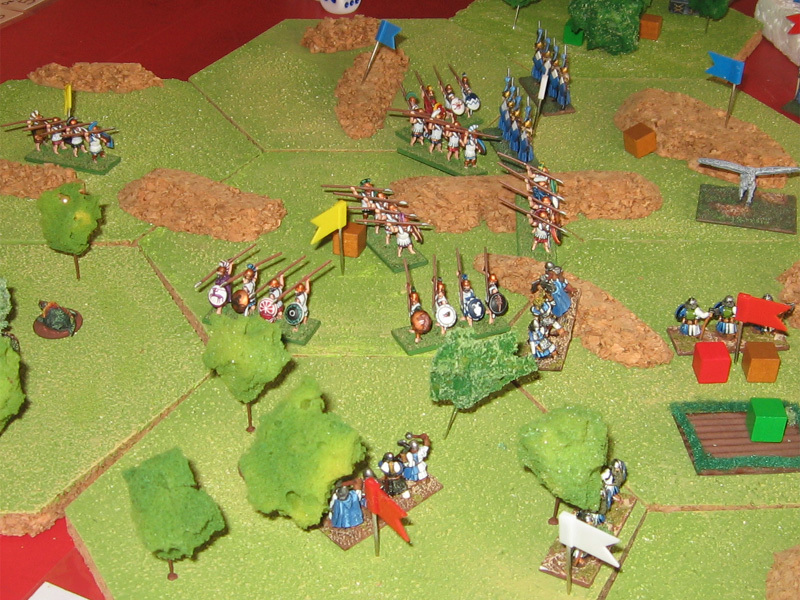 The White Flag indicates that the Elven Unit is Exhausted, unable to roll Offensive Dice and slighty more vulnerable to being attacked. With the Greeks focused on the Elf border, the Dwarves retake their Province. The Dwarves start fortifying (Red cube) their border Provinces and building farms. The Elves finally beat the Greeks back and all three Empires settle down to a serious arms race. 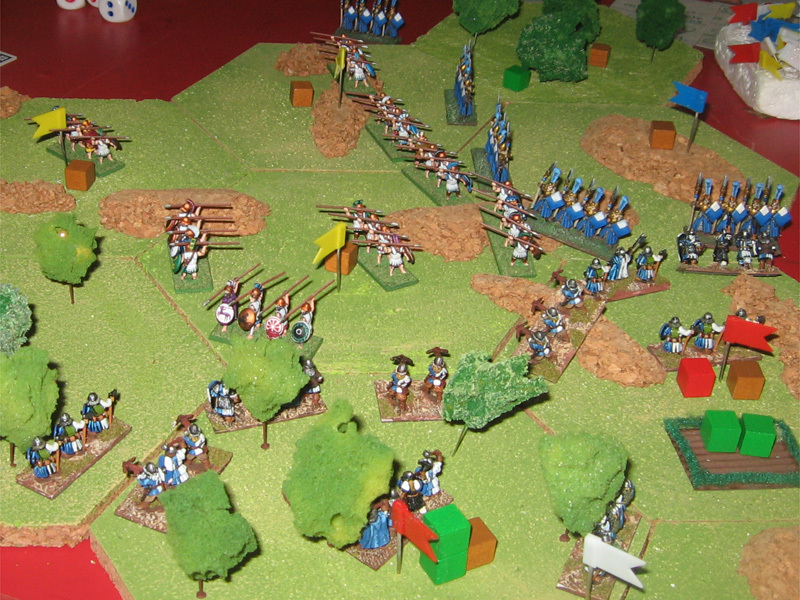 Refreshed and rearmed, the Greeks launch a final massive attack on the Elves. The Dwarves take the opportunity to sneak into the last Neutral Province, home of the last of the wild creatures, three giant lizards. Overall I was pretty happy with this first playtest. The game took about 3 hours in total. 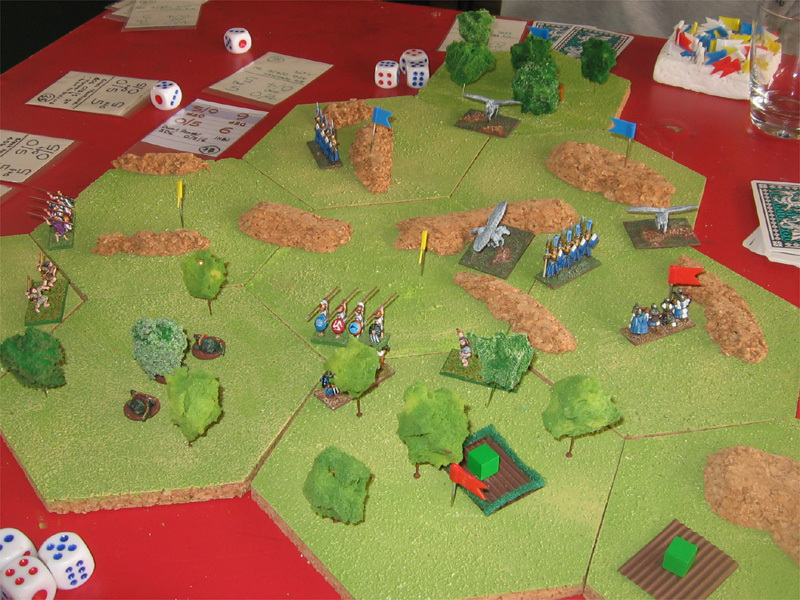 Seemed to be fast, fun and easy to play. The Resource System was a bit complex but didn't take too long to get a hang of. The Combat System worked very well. 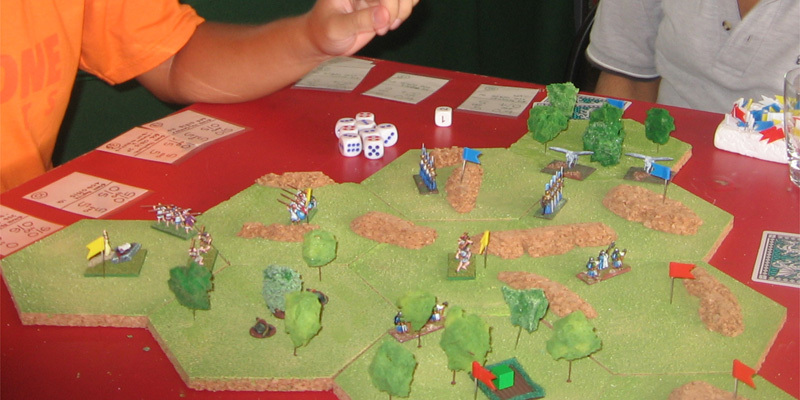 The one action per player per turn did its job keeping everyone involved all the time. I estimate a player turn took between 5-60 seconds with an average around 30 seconds. The only serious problem we faced was the victory conditions which were way too difficult to achieve. We all agreed after the game that 4 Provinces or a 50 Gold Temple would have worked much better.